The ADXL321 is a small and thin, low power, complete dual-axis Accelerometer with signal conditioned voltage outputs, which is all on a single monolithic IC. The product measures acceleration with a full-scale range of 18 g (typical). It CAN also measure both dynamic acceleration (vibration) and static acceleration (gravity). 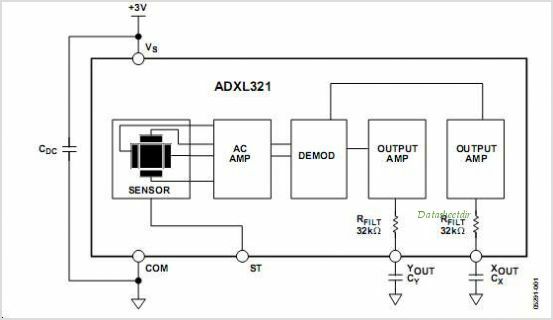 The ADXL321s typical noise floor is 320 g/Hz, allowing signals below 3 mg to be resolved in tilt-sensing applications using narrow bandwidths (<50 Hz). The user selects the bandwidth of the Accelerometer using capacitors CX and CY at the XOUT and YOUT pins. Bandwidths of 0.5 Hz to 2.5 kHz may be selected to suit the application. The ADXL321 is available in a very thin 4 mm 4 mm 1.45 mm, 16-lead, plastic LFCSP. This is one package pinout of ADXL321,If you need more pinouts please download ADXL321's pdf datasheet. 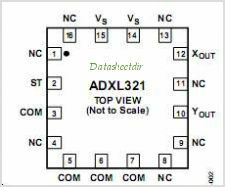 This is one application circuit of ADXL321,If you need more circuits,please download ADXL321's pdf datasheet.